We lie on the red-checkered blanket with weeds and flowers all around us, caught in the fleece. Our breaths carry our dandelion wishes higher, higher, until they become the clouds we watch. Sometimes we looked for animals or ice cream cones or angels, but today we only lie there with our palms together and our fingers tangled, and we dream. We wonder what lies beyond. One day, she will grow up and imagine death as an angel that will lend her wings, so she can find out. Death, unfortunately, is not in the business of lending wings. Once upon a time, it made Liz happy to TP a house with Julia and Kennie, to be invited to the best parties. Once upon a time, it made her happy to look down the social tower and see everyone below her. Once upon a time, it made her happy to stand here and see the entire sky above her. And tonight—tonight, that was what she wished for. She wished to be happy, and fell asleep with an entire sky watching over her. Funny things, aren’t they? People. They’re so limited. Seeing is believing and all that. As though watching Liz will keep her alive. As though by remembering, they know her, intimately. As though they guard all of her secrets, and by staying close, they can keep her safe. I think it must be because they can only see so much of the world. All those boundaries—pupils to focus, lids to close, distances to cross, time to navigate. What Julia doesn’t know is this: Liz knew. Liz had always known that the drug was tearing Julia’s life apart. She knew that it was her fault. She knew that the ziplock bags made Julia lonely, but she didn’t know how to help. Some nights, Liz looked back and counted the bodies, all those lives she had ruined simply by existing. So she chose to stop existing. She cannot bear to catch fireflies in jars. She hates zoos. She will not let her father teach her about constellations, because she will not trap the stars. She lives in a world made entirely of sky. 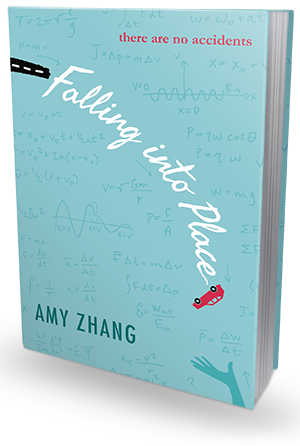 Falling Into Place is one extraordinary novel - intense, powerful, meaningful and potentially life - changing (maybe even life-saving). It hits so close to home, it's really kind of scary. It pokes at the darkness we all carry in our souls, whether we want to admit it or not. It examines the weaknesses and the faults, the what ifs and if onlys, the flaws and imperfections. And it makes you realize that we never really know other people, even if they're our best friends or family members, and sometimes we don't even know ourselves. Funny things, aren’t they? People. They only believed in what they could see. Appearances were all that mattered, and no one would ever care what she was like on the inside. No one cared that she was breaking apart. This is the story of Liz Emerson, who saw no point in living anymore and decided to die. And it's told through different perspectives of many different people - including closest friends, Liz's mom, a boy who loved her from far away, and Liz herself. Brilliantly narrated and seamlessly woven together, these little snapshots of Liz's life before she crashed her car and the searing aftermath of that event paint a shocking, profoundly moving and painfully realistic picture of depression, loneliness and hopelessness that drove one girl to suicide. An unforgettable read through and through. Liz was very confident and brave. An unstoppable, thunderstorm of a girl that was always in control. Or so it seemed. She wanted to be strong. And in a way she was. She was so strong, her heart turned into a stone that plummeted down like a meteor from the sky and sank deep into the ocean of despair. Because though tough and popular, she was also very, very lonely and scared. Scared of silence. Scared of being alone. Scared of living. Damaged and broken inside. A week—that’s what she allowed herself. An entire week before the last day. She thought of Julia filling herself up and Kennie becoming empty, and she understood. Life was precious. She knew that, knew it deeply, so she would try again. She would try what she tried on the night of the party, but she would do it right this time. Seven days, seven chances. She would wake up seven more times and search again for a reason to go on. She would give the entire world a week to change her mind. There are many electrifying emotions oozing from this book, but out of them all regret and self-loathing are so strong they're almost tangible. Liz is not a perfect girl. Her life is not perfect. Her family is not perfect. Her friends and boyfriend are not perfect either. There are no perfect people after all. Liz, however, seeks validation and approval, she wants people to like her, she wants to be seen. And unfortunately, she hurts many people in the process. She's not cruel, oftentimes she regrets her actions - the bullying, the mean remarks, the way she can destroy a person with just a few words - she just can't seem to be able to stop herself. She's just Liz. But then she sees all the damage she's done - to strangers, to her closest friends, even to herself - and she hates herself. She gives herself one week to turn things around. To change, find something worth living for. But when a week comes to an end and things seem to be even worse than they were before, she crashes her car, hoping to die. And then here's what really got me - it's not a cry for help (she doesn't believe she can be helped anymore), she plans everything so that it looks like an accident. She doesn't want people to blame themselves for not noticing, doesn't want to cause her mom and her friends any more pain than necessary. That alone was enough to make me want to hold her close and give her a reason to live. She's not a bad person, she's just lost, she needs help, she just doesn't know how to ask for it. I personally can't find any flaws in this book. Everything from the way the story is told - in many alternating points of view, jumping back and forth in many timelines, showing snapshot-like moments from Liz's life and then taking a closer look at what other people in her life do, think, feel and how they perceive Liz herself - to the amazingly drawn, multi-layered, authentic characters, evocative writing and the powerful messages it caries, all that is downright fantastic. But what I particularly love about it is how the author constructed the plot line around the recurring theme of physics and Newton's laws of motion. It is so meaningful and brilliant, I was really speechless seeing how the events in Liz's life tied town with the laws - laws she didn't even understand! And how she kept on wondering about them and tried to make sense of her own life by applying them. Each action has an equal or opposite reaction? But how can that be, when all she did was destroy others and she never got punished for it, she never faced any consequences?! She tried so hard to understand, she thought about it until the last seconds before the crash. And when she finally did understand, the realization was life-changing, illuminating and freeing! I loved it. I really loved it. Fall Into Place caries a powerful and affecting message that it is rarely just one big event that causes us to break and tumble over the edge, it's almost always a constellation of little cracks and emotional bruises, each of them impactful in their own way, and accumulated together these events are like an anchor to your neck. And, most importantly, that no matter how lonely we feel, no matter now much we hate our lives (or even ourselves), mo matter how bad things look sometimes, there is always someone who loves us just the way we are, someone who sees us and accepts us, someone who needs us and wants to be there for us. And there is always something worth living for. It's never too late to turn things around, we have the strength to pull through, we just need the will.